Ravioli (plural; singular: raviolo) are a type of filled pasta composed of a filling sealed between two layers of thin pasta dough. The filling may be meat-based (either red or poultry), fish-based, or cheese-based. 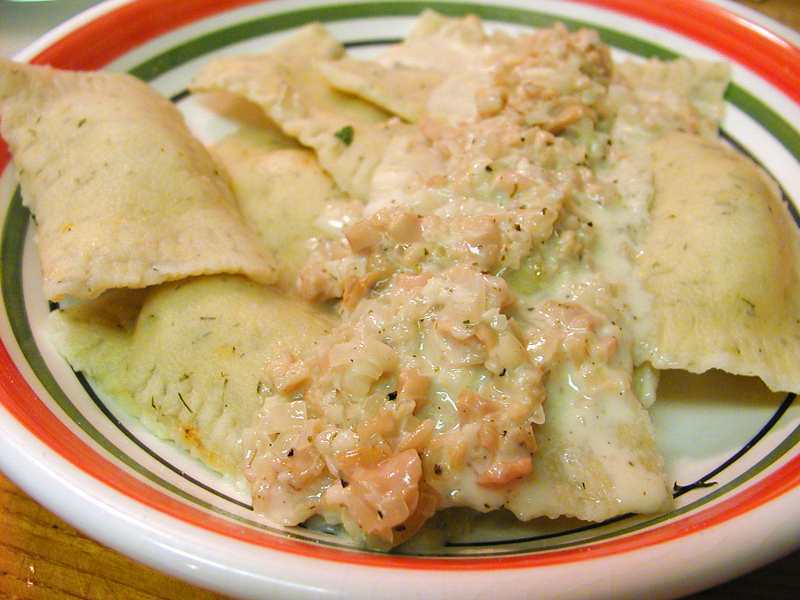 Ravioli can be rectangular, triangular, half-moon or circular in shape. Left: Lemon dill shrimp ravioli. Other traditional Italian fillings include ricotta mixed with grated cheese and vegetables such as spinach, swiss chard, or nettles or they may be a puree made of potatoes, mushrooms, pumpkin, chestnut or artichokes. Ravioli are often topped with a red tomato-based sauce. More delicate fillings are often paired with sage and melted butter, or more rarely with pesto- or broth-based sauces. Today, ravioli are made in worldwide industrial lines supplied by Italian companies such as Arienti & Cattaneo, Ima, Ostoni, and Zamboni. "Fresh" packed ravioli usually have seven weeks of shelf life. Canned ravioli is arguably the most widely available form of ravioli available in cultures where ravioli is not a common dish. This type of ravioli is filled with either beef or processed cheese and served in a tomato, tomato-meat, or tomato-cheese sauce. Canned ravioli has more in common with other canned pastas than with traditional ravioli dishes. Its roots are in traditional American "red sauce" Italian-American restaurants opened by Italian immigrants in New York and other cities. Similar foods in other cultures include the Chinese jiaozi or wonton, the Russian pelmeni, the Ukrainian vareniki, the Tibetan momo, the Turkish mantı, German Maultaschen, and Jewish kreplach. Preparation of home-made ravioli with ricotta.